Writing. Does the word scare you or remind you of bad college essays? Or maybe you don’t think you can write. the only writing in your life is to help your children through their homework. If this sounds familiar, then maybe we need to rethink the meaning behind it. Writing is an art form, but it is also another way to speak; a way to express the simplest of feelings and ideas. Take Facebook for example, that’s all about writing. But do you think of your “status” updates as work? Of course not. It’s relaxed and enjoyable (or should be, anyway) and there isn’t a whole lot of stress behind it. But guess what? You can take this same enjoyment and apply it to other writing as well. Perhaps you are feeling a little overwhelmed with life. Maybe your tolerance level for your kids, work and house cleaning has hit its threshold. 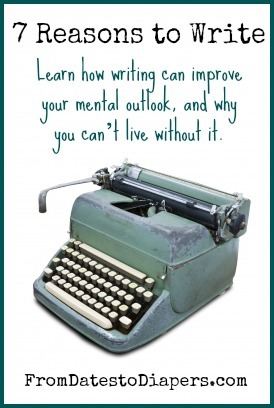 Here are seven reasons to write, how it can improve your mental outlook, and why you can’t live without it. There is something about the written word that evokes inspiration. Whether it’s a to-do list or New Year’s resolutions, words staring back at us make us respond. They almost force us to move, do or commit. Even if the list is long, and the chores are many, writing them down and hoping to do them can be enough to make them appear achievable. Write out your goals and act on them. Real words inspire us and our future. Make short term and long term lists and see what you can do! Ever hear how writing in a journal is therapeutic? Ever wonder if it is a bunch of malarkey? Then try it for yourself and see how amazing it is. Even writing a journal entry — to cap off a horrendous or honorable day — frees bottled-up emotions. Dr. Oz, the ubiquitous and noteworthy cardiothoracic surgeon, recommends keeping a gratitude journal. He says it’s “…a beneficial thing to approach everyday with an attitude of thankfulness.” Hey, if the doctor is saying it, perhaps he’s onto something. We can easily become confused about ourselves because of our busy lives. What do I mean? Well, sometimes we want certain things (to lose ten pounds) only to change our mind when something else takes our attention (But, it’s only two scoops!) We lose sight of our goals. By revealing our feelings, dreams and desires in print, we not only know why we desire something, but we keep our focus on the main objective. A few minutes of writing things out prevents wasted time and misplaced priorities. Print out this list and stick it to the fridge or mirror where you can’t miss it daily. Anger, isolation, loneliness: these are all normal — and inevitable– parts of our lives. Though reacting to negative situations (loss of job) or whining and groaning to our buddies is a human response writing them down not only allows us to materialize what we feel, but it keeps unnecessary verbal explosions in check. When bad news comes — and it will come– go to the pen and paper … and then talk it out. And I don’t mean on Facebook, folks. Keep it to yourself this time! In today’s age of “me, me, me” it is obvious we all clamor for worthiness. But usually, we won’t find true worthiness in others’ words. We instead have to look in our heart and know we are worthy just because we are. That’s where the truth of who we are speaks the loudest. What should you do when you’re feeling a bit invisible? Make a list of all your fabulous qualities, or attributes. Tape them to your mirror and look at it daily. It will remind you of your worth, even when you are feeling a little worthless. Facing a big decision? Write out the facts and list the pros and cons before you make the choice. Many times, the answers in life aren’t clear. Our friends opinions — as great as that can be –can’t make the decisions for us. Write out how you feel; write out the future consequences to various decisions, reveal your heart’s desire and worst fears. Sometimes we need super x-ray vision when we can’t see straight. But by writing things out, we can focus in on what is important and weed out the distractions. Sure, some people have the gift. You know, the gift; those with the great-American novel sitting in their mind just waiting for release. But do you? If you love to read, perhaps that book is inside of you too. Feel like a horrible writer? Then work on your craft. Stephen King said in his book, On Writing, that he believes “ … large numbers of people have some talent as writers and story-tellers, and that those talents can be strengthened and sharpened.” So, keep at it. Your writing could be the spark of creativity just waiting to light the fuse of a new world. Find a journal, a computer, a blank sheet of paper and get to work. Write out goals for the year and then write out your long term goals for ten and twenty years from now. Begin a gratitude journal, or write a simple thank you note. When was the last time you wrote one of those? Start today and who knows – your words may not only inspire you, but the entire world … and make you mentally healthier than you’ve ever been before. Heather Spiva is a freelance writer from Sacramento, CA. She is married to her firefighter husband and has two young boys that keep her busy. When she’s not taking care of them she’s writing, or reading, and when she’s not doing those things, well … it’s hard to say. It rarely gets to that point. She just released her first book this year, a middle grade/young adult book called The Puzzle Master. Visit her blog for more information www.heatherspiva.com or to Amazon.com and find it there – It’s only 99 cents for the Kindle version! Hi, my name is Karli and I am a student. I’m doing a survey for mothers with preschool for a school project. It would be nice if you could fill out my survey. Thank you! Anne´s last blog post ..Goodwill’s Best Kept Secrets – With First-Ever Smash Mob!